Meet the Innkeepers, Denise and Michael Gleason. Married 28 years, Denise has been an international flight attendant for American Airlines for 30 years. Michael is a retired special educator for North Carolina. For 34 years, Michael taught special ed and coached both football and baseball in the middle school and high school levels. They have 2 children, Megan who you can find working along side with her parents at the Jarvis and Brett, who lives inCharlotte and attends UNC-Charlotte. In June of 2017, both Michael and Denise came to New Bern for Father's day weekend and the opportunity presented itself to buy a B and B and make it an event space. Michael had just retired the previous week and wasn't sure of his future endeavors, and Denise had always thought of doing more than flying those friendly skies. So, with a lot of hard work and surrounding themselves with a fabulous team, they now have a beautiful life dream become a reality. They hope you will come stay here or have your next event here at the Jarvis at 220. Historic New Bern rests where the Neuse and Trent rivers converge, 2 hours east of Raleigh and 30 minutes from the North Carolina coast. 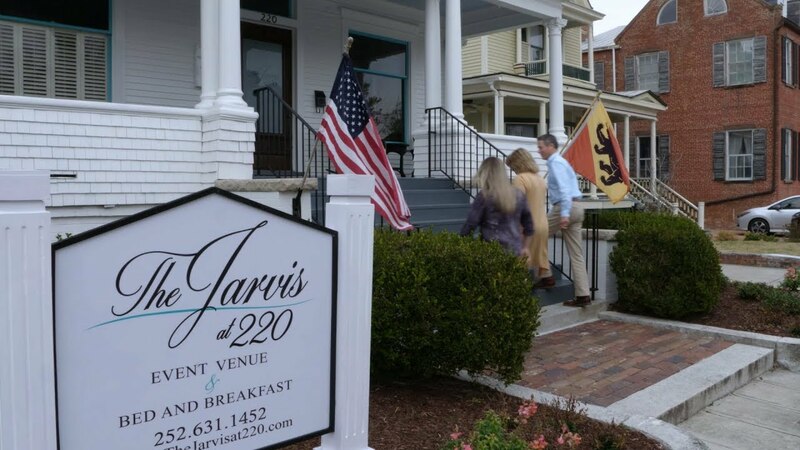 In this picturesque small town with so many wonderful restaurants, beautiful churches, historic homes, you can stay at the Jarvis at 220 and walk everywhere in downtown. There is always something happening in New Bern, from March through December, weekends are always bustling. Make your plans today to come stay with us. Picture yourself sitting on the porch with a cup of coffee or tea in the mornings or a glass of wine in the afternoon.